A desperate mum is risking jail by importing an illegal drug she believes is giving her terminally-ill daughter a chance of survival. 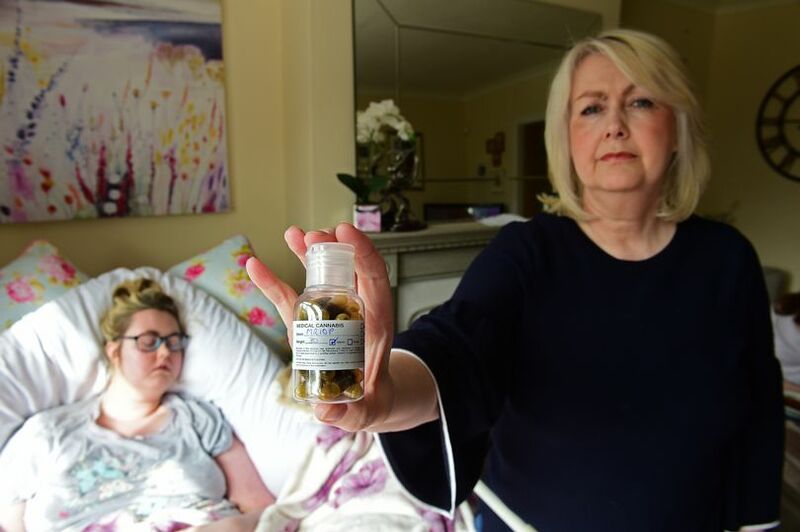 Sandra Munford, 53, is spending £1,300 a month to import cannabis oil from abroad to treat Kate, 21, who has been given just three months to live. 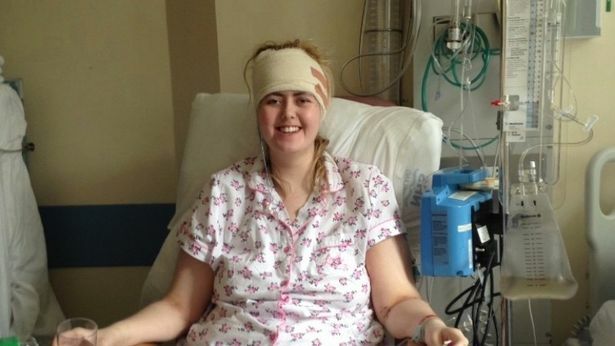 Terminally ill Kate has had four major operations and gruelling courses of chemo and radiotherapy as she battles a brain tumour. Doctors have said there is no more they can do, reports the Daily Record . With her daughter now unable to walk or talk, Sandra decided to break the law and buy cannabis capsules from Canada, where they are legal. She said: “I’m willing to do whatever it takes to ease Kate’s pain, even if it means going to prison. My daughter is dying and I’m in a desperate situation. "We’ve tried every other treatment available and nothing has worked – this is our last hope. Providing round-the-clock care for Kate has left Sandra unable to work. She is faced with the prospect of having to sell the family home in Kilmacolm, Renfrewshire, to fund the continued purchase of the expensive treatment, having already used most of her life savings to have supplies shipped from overseas. Sandra, who is also mum to Beth, 19, said: “I’m using the last of the money I have right now but any parent in my position would do the same. “I’ve never taken illegal drugs but I can already see how it’s benefiting my daughter. Kate takes one capsule at night and I’ve no doubt it is helping. Kate is bed-bound and can no longer eat or drink without help. But after five weeks of taking the capsules, Sandra says she has seen small improvements in her health. She said: “Seeing your daughter fall apart before your eyes is heartbreaking. Since she started taking cannabis oil, we are already seeing some positive changes. "The right side of Kate’s body was completely frozen but now she’s slowly able to move her right leg and arm. “Her mouth was also dropping down to one side and it’s now back to normal. There’s no doubt in my mind it’s down to the cannabis oil. Sandra wants to see a change in the law to make cannabis products for medical purposes more easily available. Cannabis is currently a class B drug carrying a maximum sentence of up to five years in prison if users are caught in possession. Sandra said: “It’s helping ease the pain Kate’s experiencing. We realise she’s still very ill but I know I’m doing the right thing. "I’m going to do whatever I can to give her every chance to beat this. If that means breaking the law, so be it. “Before she started taking the drug, things were so bad that we thought Kate wouldn’t last. She struggles to do the smallest things and it’s so frustrating for her. “Her decline happened very quickly. In November, we thought she was going to be fine, and then she just went downhill. Kate was diagnosed with a grade three astrocytoma in March 2016 after experiencing severe headaches and double vision. It was the latest heartbreak to hit the family after her dad Bryan, 41, suffered a massive heart attack and died in 2010. Surgeons were able to remove 80% of Kate’s tumour, along with four litres of fluid. But within months, the mass had grown back. When chemo tablets and radiotherapy failed to reduce the growth, the family began looking into medical cannabis. The oil Kate takes contains controversial tetrahydrocannabinol (THC), a psychoactive substance that is illegal to buy or use. A leading doctor has backed Sandra’s call for cannabis to be legalised for pain relief. Brain injury expert Professor Mike Barnes, of Newcastle ­University, said “There’s no doubt that cannabis oil has anti-cancer properties and that’s been shown definitively in animal models of cancer. “While there’s no proper long-term trial in human cancer because THC is illegal, there is anecdotal evidence to suggest that, in some cases, people taking cannabis oil can slow down tumour progression. Sandra added: “I believe I’m doing the right thing and I know the oil is safer than a lot of the drugs I have in my cupboard. "I’m not advocating hard drugs at all but in exceptional cases, like Kate’s, substances for medicinal use should be made available. A spokesman for campaign group End Our Pain said: “People in these distressing circumstances are patients, not criminals. help with a number of conditions, including chronic pain.